A savvy guide that takes you from dreaming of a log home to actually building and living comfortably in one. Industry insider Roland Sweet reveals tips and insights about the various facets of designing a log home, selecting a log-home producer and evaluating log packages. Plus you’ll get real-world advice on calculating costs, what to look for when buying land, making energy-wise decisions, the importance of assembling a team that shares your vision, working with a builder and much more. An invaluable resource, complete with photos, advice from log-home owners and an extensive and useful appendix. 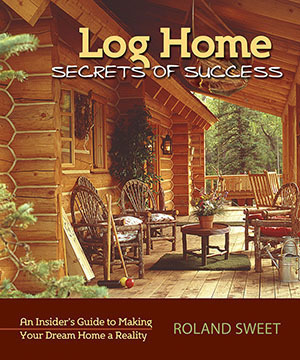 Roland Sweet was a respected author, editor and 30-year veteran of the log home industry. In 1989 he was named the founding editor of Log Home Living magazine, and over the years he served as editor of Log Homes Illustrated, Timber Homes Illustrated, and Distinctive Wood Homes. His book, Log Home Secrets of Success, was released in 2010. Through his writing and his workshops at log home shows, Roland helped thousands of people realize their own dream of living in a log home. The log home industry lost a legend when in July 2015 Roland passed away suddenly. We will miss you, Roland ... your quick wit, your wisdom and your generosity.